Eastleigh suffered a dismal 3-0 home defeat against promotion chasing Ebbsfleet United this afternoon. It was a second loss in a row and a fifth defeat out of eight previous league games for Ian Baird’s side. Victory for Ebbsfleet saw Liam Daish’s side all but guarantee a play-off spot – they now need just two points from three games to secure their place. Eastleigh meanwhile still have a chance if they can take maximum points from their remaining games against Boreham Wood, Hampton & Richmond and Bromley and, with a bit of luck other sides in the top seven dropping points between now and the final day of the campaign. Ian Baird named an unchanged starting eleven to the side who were defeated away to Maidenhead in midweek and started the game fairly well looking the brighter side in the opening stages. Tony Taggart closed down an Ebbsfleet defender in the opening minutes where the ball cannoned towards goal but went wide early on. Eastleigh had two corners within the first twelve minutes but failed to trouble the visiting goalkeeper Preston Edwards despite their towering presence from set pieces. The deadlock was broken by Ebbsfleet in the 14th minute when ASHLEY CAREW found himself in acres of space, unmarked in the centre. Craig Stone sent a perfect looping cross from the right and Carew didn’t need a second invitation to steer his well-placed header into the corner of the net beyond the dive of Jason Matthews from 10 yards. Ebbsfleet went from strength to strength after the goal and could have increased their lead when Ram Marwa won possession just outside the Eastleigh penalty area. Michael West picked up on the loose ball and sent a half volley over the bar. It wasn’t until the 34th minute that Eastleigh mustered their first attempt on goal. Ian Herring’s long throw was launched into the box where Tom Jordan’s header eventually fell at the feet of Jamie Slabber. The Eastleigh top goal scorer had a sight at goal but his side-foot shot lacked power and provided a simple save for Edwards. Four minutes later Slabber had an ever better chance to pull Eastleigh level with a close range header that was tipped onto the cross bar by the visiting goalkeeper. Chris Holland had a header saved from the resulting set piece. With the half coming to a close, RICKY SHAKES was on hand to double Ebbsfleet’s lead following an excellent attempt by Carew. The former Eastleigh midfielder worked space for a thunderous shot from the right of the area, which Matthews could only parry; such was the power in the effort. Shakes pounced on the rebound to find the back of the net and leave Eastleigh with it all to do, two goals behind at the half way stage. Just before the break, Richard Graham held the ball up well before playing the ball to Tony Taggart whose shot flew harmlessly high and wide of the target. Eastleigh were forced into their first change of the game at the start of the second half with Ross Bottomley coming on to replace the injured Chris Holland at centre half. A mere twenty seconds after the restart, Ebbsfleet had stunned Eastleigh with a third goal; the Spitfires would still have had manager Ian Baird’s team talk ringing in their ears when they were hit with another hammer blow. It was that man ASHLEY CAREW who again popped up to inflict further damage against the side he helped get into the play-offs two seasons ago. Carew picked up on a cross from the left, and received the ball due to Luke Byles’ missed interception in front of goal. Carew made the finish look easy as he skipped past his marker, coming inside and drilling a low shot into the bottom corner with his left foot. It was his second and Ebbsfleet’s third goal of the game. The second half was seemingly over before it had begun with the game near enough out of sight owing to the third goal. Richard Gillespie came close for Eastleigh on the hour mark when he linked up with Danny Smith to turn his marker well and fire a shot just past the post. It was to be his last action of the game however, as Baird sent on Shaun McAuley in his place. Eastleigh’s final roll of the dice saw Jamie Brown come on to replace Richard Graham. The Spitfires did improve marginally with Jamie Slabber forcing a save out of Preston Edwards with a curling left foot shot before Jacob Erskine came within inches of adding a fourth goal for the visitors. 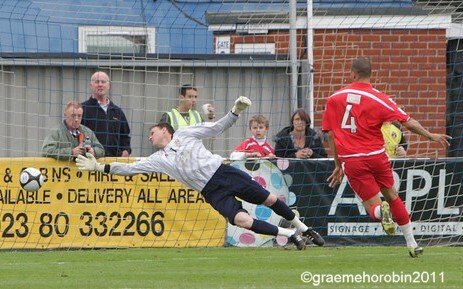 The Ebbsfleet substitute raced through but was denied by a fingertip save by Jason Matthews. Ten minutes from time, a dangerous delivery from a Carew free kick evaded everybody in the centre before Calum Willock headed over the bar from a Derek Duncan left wing cross. In the 84th minute, Jamie Brown set up Danny Smith with good hold up play. The Eastleigh midfielder unleashed a powerful strike at goal and had to be kept out by a smart save by Edwards. Ebbsfleet went straight up the other end of the pitch where Joe Howe crashed a shot from outside the area against the Eastleigh cross bar. With the game coming to a close and the result already secured, Eastleigh had three final chances. First Jamie Slabber’s free kick beat the wall but provided a comfortable catch for the goalkeeper in the 87th minute before Jamie Brown had a goal bound header cleared expertly off the line by Duncan in stoppage time. The final action saw Slabber have a good opportunity in front of goal but under pressure and the ball falling on his weaker right foot, the shot was scuffed straight at Edwards. Keep the faith, there is still a chance. Here’s hoping for a productive Easter period and maximum points from our three remaining games to end the season on a high. Come on you Spitfires!